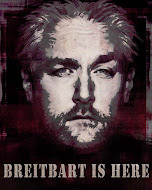 That's right folks. 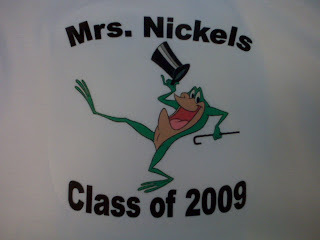 We "Borrowed" Michigan J. Frog from Warner Brothers and made a batch of shirts. (and before the lawyers call we DID NOT CHARGE FOR THIS and we only made 20 shirts for the kids. Think of it as free advertising for you). 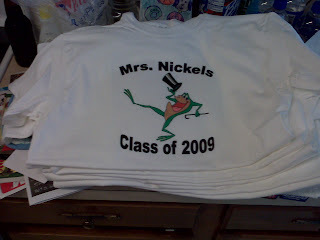 We were going to make a batch with me printing off the graphic and then tracing and inking each shirt by hand. Fortunately for everyone involved Ben's uncle Louie dropped the suggestion to try iron ons. A quick trip to The Wal-Marts and BLAMMO! We had a graphic which once run through a mirror effect was printed, ironed on and ever so stylish. Iron ons took me back. Now I am thinking we should start doing retro shirts with iron ons for some side cash? Starsky and Hutch, The A-Team, Battlestar Galactica style iron on shirts, but with the modern shows cast and stuff. I think I could even add the weathered look. Anyone interested, let me know if the comments. Make up a request and I'll work up some graphics. This one got banged out pretty quick and I think it didn't look too bad. Here's a close up of the final product. Very cute! I would love a Starsky and Hutch t-shirt, but only with the original cast. I think Ben is really lucky to have such wonderful, loving parents!